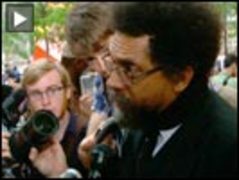 Frances Fox Piven at Occupy Wall Street: “We Desperately Need a Popular Uprising in the U.S.” | Democracy Now! Distinguished Professor of Political Science and Sociology at the Graduate Center, City University of New York. She is the author, most recently, of Challenging Authority: How Ordinary People Change America. MIKE BURKE: Begin by telling us your name, who you are, and why you’re here. FRANCES FOX PIVEN: Frances Fox Piven. I teach at the Graduate School of the City University of New York, and I’m here because I’m so enthusiastic about the possibilities of this sit-in, of the marches that are occurring over postal worker issues, of the sort of sister demonstrations that are starting in Chicago and Los Angeles and maybe in Boston. I think we desperately need a popular uprising in the United States. None of us know—I study movements. We don’t know the exact formula, when those movements erupt. But it could be. And if that’s true, then these people who are here are really wonderful. And I would do anything to help them. MIKE BURKE: And how does this protest compare to others that you’ve seen in New York City? FRANCES FOX PIVEN: Well, it’s smaller, because it’s a beginning, although protests in New York City nowadays always look small, because the police always kettle the protesters—a few on this sidewalk, a few on that sidewalk—so that people have no sense of their numbers, of their support, of their power. That’s the strategy. In a sense, we in New York City have lost the right to assemble, a constitutional right. I remember way back in the 1960s and '70s. We always demonstrated in City Hall Park, inside the park, on the steps of City Hall. That was our territory. That was where you came to demonstrate. And now there are iron gates all around it, and we're consigned to sidewalks. MIKE BURKE: And can you talk about how organized labor fits into this movement? FRANCES FOX PIVEN: I think organized labor is part of this movement. It wants to be part of this movement. But I think organized labor is not itself a movement. Organized labor is its organizations, organizations that have developed over decades, that they’ve used member dues to—they have investments. They have organizations. They are risk-averse. Now, in a way, you can’t blame them for that. You know, they’re responsible for the organization, even though the organization itself is losing numbers and treasury. But the question for me is whether organized labor—not whether it will take the lead, whether it will occupy public spaces, whether it will occupy factories. The question is whether it will support the people who are ready to do it, with its legitimacy and its resources, because we need organized labor to be part of this. MIKE BURKE: And finally, what is your message to the young people that are camping out every night here? FRANCES FOX PIVEN: You know, I think you’re just wonderful. I don’t think there ever has been a movement without young people, lots of young people, maybe young people in the lead. That partly probably has something to do with biology, with youth and energy and the incredible hope and imagination that goes with that. It probably also has something to do with the position in life. They haven’t yet acquired the heavy yoke of a job, a family, a mortgage, and so forth. So I think we need young people. Young people are being very badly hurt by the economic crisis. They’re being badly hurt as workers. They have extremely high rates of unemployment. They’re being badly hurt as students. The colleges are being cut back, especially the public sector colleges. So they have real grievances. But they also have a real capacity to lead a movement. MIKE BURKE: Thank you very much. FRANCES FOX PIVEN: Thank you.